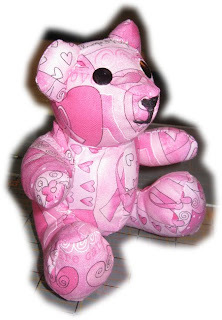 I recently wanted to learn how to make a small teddy bear. 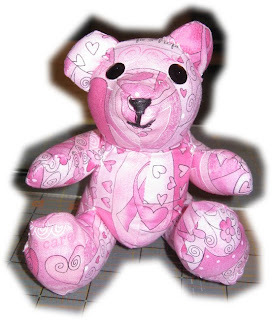 I had never made one before and knew that I just wanted a basic teddy bear, not one with jointed arms or legs. I found a free pattern on the internet went about cutting out my fabrics. It was not an easy task working with those small pieces under the sewing machine foot but I was determined. I made my bear in the sitting fashion. I'm going to try a larger one and see if that's any easier. But all in all, not too bad for my first attempt. Great project for left over fabric. Note Added after posting - This one is 6" tall from seat to ear and 4" deep from foot to back. He's a little guy. If anyone has found any other free patterns, please send me a link. Or, if you have any pointers on working with small pieces under the sewing machine, I'm all ears! **tip** for small pieces -shorten your stitch length, then you don't get pointy curves. Trish - This past weekend, i struggled with the small pieces of a zebra stuffed animal. I had a baby shower on Saturday. All week, I slowly made progress on the stuffed animal....Then Friday came, I spent 6 hours on it. Then Saturday came, I spent 4 hours on it before I had to go to the shower. In the end, I had only a picture of the work in progress with an IOU. I was amazed ad the difficultly working with such small items!! Your first attempt looks great! It is very cute! I will post my zebra soon, when I get it wrapped up!